Added ignition wires and wire looms. Lengthened injectors so scoop would clear roof (reversed scoop so it faces forward). 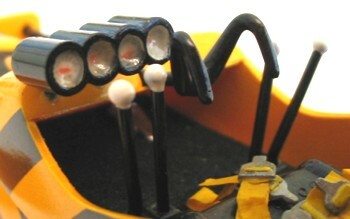 Headlights from Revell 32 Ford 3-window coupe. Added gauges made from original injectors. 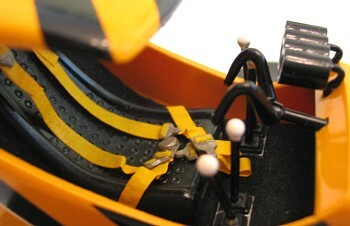 Added seat belts from masking tape and Pro-Tech resin buckles. Decals are just black decal film cut in strips. Paint is Testors yellow with a little red added to make it darker. Orange on engine is Tru-Match #24 orange over white.